ITSRG Twitter followers are no doubt aware that we have been tracking the rapidly growing Internet and Mainstream Media (MSM) story of our Graduate Fellow Michael Rovito's exchange with GOP Vice Presidential candidate Sarah Palin at Tony Luke's in South Philadelphia this past weekend. It seems clear from the video captured of the Rovito-Palin exchange over US strategic interests in and around Pakistan that neither she nor her handlers anticipated that folks in South Philly would have the sophistication to be concerned and conversant about their campaign's foreign policy positions. The Rovito-Palin exchange, now infamously referred to in the blogosphere as the Cheesesteak Gaffe, is of interest to the information technology and geographic blogging communities. We noticed that the entire exchange was captured and recaptured by others in the crowd on cell phone cameras. The end of the video footage shows Governor Palin helping one of those cell phone users to verify her identity to the conversational partner with whom he was speaking. We have all done it - we see something, someone, some place of great interest and immediately pull out our mobile devices and contact members of our social network to let them in on our mini adventures and encounters through sharing stories, photos, email messages and GPS-derived locations on-the-fly. This epoch decentralization of the technologies used to stay connected with our social networks and to exchange digital information illustrates the importance of understanding not only the viral way in which information is shared, but also the proxy arrangements that are embedded within those information exchanges. That the actual questions posed to Palin by Rovito were so quintessentially geographic in nature highlights the importance for IT and geographic educators, scholars and policy makers to come to terms with the implications of the hyper-googled earth we live on. This exchange illustrates that at any time, in any place information can be brought to bear on issues and problems in real time. The explosion of news attention to the Cheesesteak Gaffe illustrates further that the speed of traveling information often obliterates the ability to interpret context. 48 hours after the exchange, political analysts like Michael Smerconish are conducting interviews with Michael Rovito to gain a sense of why he asked those specific questions. That George Stephanopoulos drew from the exchange of a citizen's questions directed towards Palin on This Week to probe McCain further about his policy stance on tracking terrorists between Afghanistan, Waziristan and Pakistan is a breathtaking sea change in not only how journalism is implemented but also in how information is exchanged. This is a story that started at the grass roots and was promoted via the internet, followed by the release of video footage taken by a CNN reporter. It is precisely because of the cell phones of ordinary people being put into use to share their excitement of a rare sighting and close proximity to Palin with friends and family that the story broke before the video footage was aired. During Michael Rovito's interview with Smerconish he reveals that he did not have time to digest the meaning of her responses until after the entire exchange was concluded. Only then did he fully grasp that he caught her on the record agreeing with Obama's position on Afghanistan. The MSM storm followed the citizen use of IT, which collapsed the geographic scales, boundaries, and protocols that accompany information flows. McCain's response has been to sequester Palin once again as the only answer to controlling the speed and power of information on the ground. His campaign failed to effectively harness social media when it opted out of the use of Twitter during the primaries; and now the strategy to geographically isolate Palin fails to recognize that the electronic footprint has already kicked up crazy amounts digital dust that cannot be contained. Last night, Katie Couric interviewed McCain and Palin, questioning them about their reaction to Rovito's questions of Palin; McCain calls Rovito a journalist involved in Gotcha politics. Then Couric reminds him that Rovito is a citizen. Here are reactions; the video of the Couric interview is embedded throughout these posts. Read Rumproast's review of the Nguyen CNN interview of Rovito, in which she questions him twice about whether or not he engaged in "gotcha" journalism (he did not, he is a graduate student who works as a research fellow of ITSRG), here. Michael was interviewed by CNN, see report here. Michael was interviewed by Fox 29, see report here. The Huffington Post discussed the gotcha comments of McCain and Palin with Couric here. Rumproast points out that Rovito seemed more knowledgeable about current global politics than Palin. Read more here. BL Rag also comments on the audacity of blaming a citizen for asking a direct question of a candidate; somewhat ironic given McCain's desire for town hall style debates. Read more here. Now, awareness isn’t all bad; in fact, it really is an important thing, an essential component to any kind of major movement for change. Lander’s point, and my own, is that awareness in isolation is pretty useless. A nice gesture, sure, but so was that 'Mission Accomplished’ banner we had flying over in the Persian Gulf a few years ago—and we all know how well that worked out. National PARK(ing) Day, as it currently exists, is all about raising awareness. It’s a powerful communication tool, taking advantage of the high visibility of its PARKs to help engender a re-imagination of the urban landscape. And to that extent, it’s fantastic. The way a message is communicated is often as valuable as the message itself (as any post-Inconvenient Truth convert to climate change activism will no doubt confirm for you), and a PARK is a pretty memorable medium. The problem, however, is that communication—even especially effective communication—can only get you so far. The message matters, obviously, but so do the various uses to which that message is put. Ostensibly, PARK(ing) Day is supposed to be about making our cities greener, and thereby more livable. For a number of the participants in Philadelphia’s PARK(ing) Day, however, making our cities greener means making them more money. Of approximately 35 “official” participants in PARK(ing) Philly, more than fifteen were architecture, landscape architecture, design or engineering firms for whom “the greening of Philadelphia” also means the greening of their wallets. While it’s not my place to say whether the various national and international firms that participated in Philadelphia’s PARK(ing) Day truly did so altruistically, it’s also impossible to deny that for such firms, a purely monetary interest in greener cities most definitely does exist. Whether or not much of Philadelphia’s “official” PARK(ing) Day event (organized, it must be noted, by the American Institute of Architects) violated the philosophical spirit of PARK(ing) Day, numerous aesthetic violations most definitely did occur, as “official” participants dispensed with possibly the most poetic aspect of a real PARK(ing) Day celebration—the meter itself. Talking the Parking Authority into extending the two-hour time limit on a space is one thing; talking the Parking Authority into actually bagging off the meters is entirely another. As if the corporatization of Philadelphia’s PARK(ing) Day hadn’t done enough to kill off the anarchic spirit of the initial event, the AIA and PPA felt it was necessary to deliver this coup de grace. Working within the law to perform an act the legal establishment might not necessarily love (but can’t legally do anything about) is different from asking the same legal establishment to allow you, just this once, to “break” the law—with official sanction. It’s like shoplifting something you’ve already paid for: for all intents and purpose, an empty gesture. For the Temple students involved in this event, however, September 19th was just the beginning of a process about more than just “awareness.” It’s about investment, it’s about involvement, it’s about imagining our future. And we’re not poised to make a cent out of the whole thing. Leslie Goodyear, Research Scientist, ITEST LRC. Leslie will share conference and journal opportunities from her recent attendance at The Tenth National Technology Leadership Summit hosted by the Society for Information Technology & Teacher Education (SITE). Stay posted here for updates beginning at 2:00 pm. The BITS publication strategy has from the onset sought to affect the geographic discourse on community geographic information systems by investigating the degree to which participatory models can be adapted to shift the locus of the development and uses of GIS from technical experts acting as community advocates to communities themselves. Our program involves high school students to learn and use GIS technologies and their experiences are drawn upon to inform our contributions to theoretical and technical developments in community GIS research. We employed three strategies as an explicit attempt to connect research goals and activities, BITS participant experiences and learning outcomes, and our community collaborative activities with contributions to academic scholarship. 1. We invited faculty and graduate students to embed their research in our project and provided workshops to train them how to connect their research foci with the BITS project scopes of work. This resulted in the creation of thematic content that has served to connect the BITS program experiences to a broader base of geographers. 2. We broke the publication pathway down into manageable components so that we could broaden the base of participation in disseminating project outcomes. This resulted in our sponsorship of a large number of graduate student and faculty presentations about the project at conferences, extending the discussion of outcomes in interdisciplinary directions we had not originally anticipated, and reaching new audiences through adding university faculty partners in other institutions. 3. We eventually worked to identify an external evaluation specialist who is also trained formally trained in Geography; this means that as we approach the end point of the project time line we have the potential to publish in both educational research and geographic fields of study. 1. Connect threads of content developed across our program activities, including through participation of high school students, HCC mentor staff members, graduate researchers and project researchers. This has resulted in more cohesive connections between student digital footprints and learning outcomes, curriculum development and implementation and dissemination. 2. Create a social network among program participants. One of the most significant challenges we had was how to create meaningful dissemination points for all of our participant audiences - including parents and students, community collaborators, student volunteers and mentors, colleagues and scholars. Our use of social media has enabled us to both get the word about what we are involved in on a timely basis as well as to elicit information just in time for publication and conference events. 3. Use our web activities as a strategic hub for managing and tracking the long term sustainability of our program. Our web dissemination strategy purposefully coincides with our no-cost year. Our aim was to assess the degree to which we could use the web to continue the program but in a new, no cost and long term fashion. The key to this strategy has been to foster participation among BITS alumni as staff members at ITSRG who are now deeply involved in creating and publishing maps, assisting us with the use of web technologies across all of our programs, and linking their skills to the pursuit of their own educational pathways. We have showcased some of the maps and field exercises they created in our posts on Citizen Cartographers in this blog throughout the month of June. 4. We implemented Write Now, a month long initiative in May to generate new publication directions and include as many people in our network of program participants as possible. The result was a massive lift of generating abstracts for conferences and publications, manuscripts in working paper form, blog posts, and the underpinnings of journal articles. The first article to appear in publication since our effort began in May 2008 will be published by the Community Literacy Journal, showcasing the application of our community mapping strategy developed by BITS for consideration of the relationship between literacy and geographic elasticity among ethnic chinese immigrants living in Philadelphia's Chinatown. Michael Rovito, the first author, was a graduate research assistant in BITS working with students to develop the mapping approach used in the article. Other manuscripts have been posted on ITSRG's working paper series and are forthcoming in book and guide format. The ITEST LRC's sponsorship of events like these has been invaluable for our program. We would never have been able to connect with other programs and assess what among best practices might apply to us if we had to investigate that on our own. We note our love of the use of Google Docs for collaboration around writing projects. Writeboard works great too. We prefer to use free, open source web 2.0 tools - those are most accessible to the broadest base of participation. This is a follow on discussion from last year's similar event; Len speaks first about successes and challenges for disseminating project outcomes. The ITEST LRC has a list of journals and outlets to consider for dissemination as well as conference events that may be of interest. Check out http://www2.edc.org/ITESTLRC/ for that info. Len starts, from the Hi Fives project. Len comments in the Hi Fives marketing and dissemination plan, which was the last push of project during the no cost extension phase. He also discusses how that will come together at the end of the project to meet the larger project dissemination goals. Hi Fives looks at how students create video games. The project supported students to created a modified game using Half Life 2, a first person shooter game. When you buy the game you get access to the source code. With computer scientists at NC State, the project team took out the violent aspects of the game and created their own game built on the software's game development engine; it features tools that permits users to drag and drop 3D environments, enabling middle school kids in their program to learn how to do game development. Original plans called for the use of conventional publication and conference presentation pathways. The external evaluator was also supposed to publish learning outcomes. Science teaching and SITE conferences were targeted arenas for dissemination originally. Plans changed through hiring a different outside evaluator. The new evaluator picked up publication themes around new research questions that arose from his interests. Creating a commercial game was not necessarily the best approach; lessons learned from that has opened new areas for dissemination. There was also a project need to go beyond the data gathering, research and publication efforts of project Co-PIs due to the large number of questions to be asked and the high volume of data to assess related to the program. Graduate assistants worked together as a teams to address that need. Through working in teams, individual interests were coupled with enough critical mass of personnel to move forward with conference proposals and journal publications. By using working group methods, large numbers of publications and conference presentations were generated, and Len attributes the ITEST renewal they received in part to this effort. What is your best paper? Len: I am most proud of the edited book volume we published called Serious Educational Games. That volume markets areas of creating educational games. Students and collaborators in our project all wrote chapters. Each told their story and how their involvement in research unfolded. How did you identify journals? Len: Science Education journals are directed towards science learning from k-20 levels. Reviewers come from old school and dont understand technology, so even though science journals were targeted, only a few resulted in publications. AACE journals are now the focus of publication directions; ISTE journals too. Did you publish in any online journals? Innovate - is one of the online journals we used. We are planning to implement game development that involves participants to create their own journeys and interact with other participants to help advance education and collaboration. What was your underlying subtext for game development? Did you feel you needed bells and whistles to compete with War Craft for instance? Len: Yes and no. My prior experience using multi user collaborative platforms, we used active worlds. It predated Second Life. It was stable and a good environment for collaborative use from multi-sites. But, using with high school students meant that the lack of game elements of competition resulted in rapid disengagement of students. The National Technology Leadership Summit is a meta conference that brings leaders from memberships organizations related to educational technology, teacher education and educational research together. Examples of organizations that are represented are at the summit are SITE and Educational Technology and SIG leaders of AERA organizations. One outcome of note for those interested in enhancing their ITEST project dissemination efforts was that this group likes to have coordinated topics that can be thematic across all of the respective conferences sponsored by their organizations. The coordination effort highlights issues they want to emphasize. The upcoming SITE conference and NET/ISTE conferences will include themes on the role of participatory media and the use of web 2.0 technologies for classroom instruction addressing the question: How can educators use web 2.0 and other media in their classrooms? They are interested in those lines of thinking; in addition they are looking at how formal and informal learning interact. Also, there are publication opportunities related to journals of these organizations; discussions continued a theme that was introduced at the 2008 ITEST PI Summit related to the interest among ITEST projects and the ITEST LRC to tell a larger story about the impact of the ITEST initiative on education in a broad way. There will be a call for papers organized by some of the journals of these education organizations that elicits manuscripts connecting youth based focus areas for outcomes that can inform better how formal and informal learning experiences can be mutually reinforcing and improve student learning, as well as to shape the development of new pedagocial approaches for technology instruction. The ITEST LRC will share information about those opportunities; in addition the LRC is organizing interest in specific conferences to create theme oriented presentations by ITEST projects, continuing an important role they have played throughout the past six years within the ITEST community. Thanks to Sarita Nair and the entire ITEST LRC team for organizing this event. Thanks also to Caroline Guigar for live Tweeting our involvement from the ITSRG direction. Please stay posted for more on our dissemination activities. ITSRG partnered with students enrolled in Environmental Policy Issues, a course offered by the Department of Geography and Urban Studies at Temple University, to mount a Park(ing) Day space on North Broad Street last Friday. The students in the course planned and executed the event. ITSRG has supported the project dissemination through maintaining a live blog of the event on our Twitter feed last Friday and continuing to integrate feedback into the project blog found at: http://plantyourpark.tumblr.com. 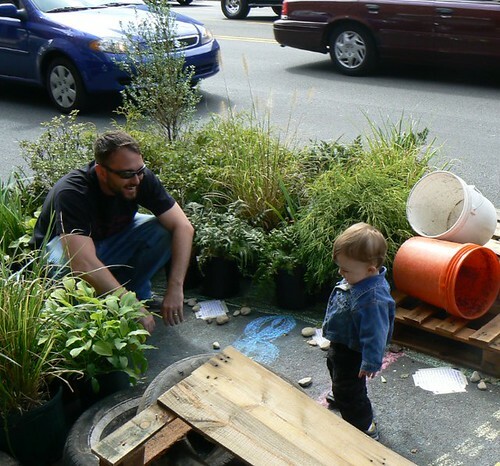 Park(ing) Day is a once yearly event that has a simple premise: organize people to plant a one-day-only park in a metered parking space, preferably in a visible and high traffic locale. The aim of the event is to raise awareness about the implications of our automobile driven lifestyles and the quality of urban spaces. The day has expanded to become an international event from its grassroots start in San Francisco in 2005. Our investigation of web activities related to Park(ing) Day reveals that very few universities explicitly engaged the event. We are aware of the University of Kentucky's GreenKY event because they followed ours via our Twitter feed and blog. We have also found information about the event organized by architecture students at the University of Southern California through their blog post. Students are clearly deeply connected with spaces that were created all over the country, however we found it interesting that little attention to their involvement per se is rising to the awareness of academic departments and researchers. We would love to catalog other events that students created in connection with their academic courses of study and student organizations, so please email us with your links. We suggest that there are at three themes that provoke interest in Park(ing) Day and other web-disseminated environmental campaigns like it for the academic and organizing information technology, education and geographic communities. First, Park(ing) Day illustrates the power of viral campaigning that characterizes web 2.0 dissemination approaches. Nearly 70 cities participated, with multiple parks created throughout via the assistance of what is now the National Park(ing) Day organization. This illustrates the rapid increase in attention to the event that has been generated within the blogosphere. Interestingly, our local official organizers encouraged us to implement our site as a "guerilla" park because we only recently connected with them when classes started in September. Given that just three years ago, the entire event was uncoordinated by local and national organizers, we found their suggestion to work outside of the organizer and city-defined parameters quite intriguiging. Second, Park(ing) Day represents the state of the blogosphere in terms of the connections between different social media to promote the event and call attention to parks created. Flickr photos are fed to national and local organizer websites, and individual parks garner attention from both mainstream and independent news media. Third, the geographic implications of the event are also noteworthy. Because flickr photos can not only be geotagged but also geo-rssed (is that really a word now? ), one can discover parks that were created well after the event occured and in concert with other photographs about unique locations situated nearby. Finally, one gains an appreciation of the degree to which organizing is being reshaped by the blogosphere and interconnected web 2.0 technologies. Our stats related to this event include not only the thousands who drove by our highly trafficed locale, the hundreds who walked by, and the dozens who spent real time in the park throughout the day - but also our Twitterers followers, the news reporters who appeared because they followed our Tweets, their audiences, our student participants and their social networks, and our broader BITS and ITSRG program participants and their social networks who track us on our blogs regularly. We suggest that the magnitude of our individual event, along with the National phenomenon, illustrates that web 2.0 and interactive mapping tools exponentially increase the numbers of people and range of their interests exposed to these activities, while simultaneously illustrating vastly different levels of engagement in the ideas and substance of the event. 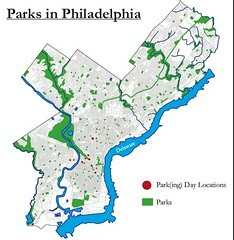 Jonathan Otto, Cartographic Intern at ITSRG created the map below of Green Spaces in Philadelphia along with Philly Park(ing) Day 2008 sites, shown in red. Our site was chosen because of the relative lack of parks and open spaces off campus in North Philadelphia.